IT'S FINALLY HERE! The end of the 31 Day Nail Art Challenge! It's been a long, hard road with many a discarded nail-varnish remover bottle paving the way but here's Day 31 - the repeat of your favourite design. 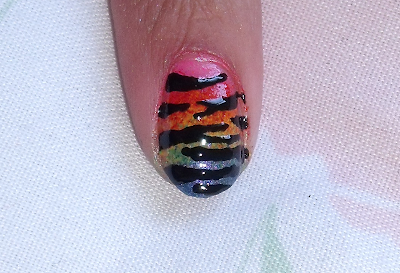 Now after doing this challenge I became a HUGE fan of animal print nail art, so decided to go back to Day 13. The nail art also follows the gradient design of Day 10. Now I've stressed how much colour means here at HanDee so decided to spice things up for this repeat and based the design on my funky shoes! Here's the design I came up with! Very easy and a lot of fun to look at! 3) Repeat this with your other colours (red, orange, yellow, green, blue and purple)! Making sure the previous layers are dry before doing any more! 5) Finish off with a topcoat! So here it is, the end of the challenge. I definitely recommend any budding nail art-ists do this as it gives you LOADS of practice at so many different designs you may not have considered doing before! It's been loads of fun!